How will Rebecca get out of jail? Season 3 ended with quite the cliffhanger as we saw Rebecca push her fake-boyfriend-turned-stalker Trent off a balcony; in the aftermath of all of this, Rebecca decides once and for all to be accountable for her actions and pleads guilty to second-degree murder. Although we didn’t see it at the end of last season, it is all but confirmed with news of a Cell Block Tango-inspired number that Rebecca will be in jail for at least part of season 4. My biggest question, though, is – what will get her out of jail? I doubt they’d somehow find a way to reverse her plea, but we know Nathaniel is committed to representing her and Paula continues to be by her side, so I’m sure they’ll go to nothing but great lengths to get her out. Will Rebecca and Nathaniel have their happily ever after? Speaking of everyone’s favorite couple, another looming question over the show’s final season is whether or not these two will get their happy ending. At the end of season 3, before Rebecca pleads guilty, Nathaniel ends things with his longtime girlfriend to be with Rebecca. Yet I’m not 100% convinced this show will have them get together at the end of the day. Season 4 is going to be all about Rebecca getting redemption and figuring out how to have a life where love doesn’t overtake everything else. As a result, it honestly wouldn’t surprise me if the series ended with Rebecca finding happiness outside of love, and specifically outside of Nathaniel. However, if the show does want to prove that Rebecca can manage a healthy balance of love in her life, the only person I see her doing that with is Nathaniel. What impact will Greg’s re-appearance have? When I first read that Greg was going to come back for the first time since season 2, I was thrilled. When I read that this time around he would be played by Skylar Astin instead of Santino Fontana, I was confused. Co-creator and showrunner Aline Brosh McKenna has said that Greg’s return will be a “great statement on how our perception of people changes.” I’m intrigued by this concept, especially in conjunction with a further exploration of Rebecca’s mental health. If anyone can pull off a casting change such as this one, it is the team behind Crazy Ex-Girlfriend. What happens with Darryl and White Josh? In the season 3 finale, Darryl finally gets the baby he’s desired via Heather’s surrogacy. Throughout the episode, it was clear he wanted White Josh by his side, which is why Heather stepped in. Thanks to her the two reconcile, although not in a romantic sense. Personally, I love this pairing so much and hope they find their way back to each other as a couple. But I also continue to appreciate the writers for respecting WhiJo’s desire to not be a parent and remaining firm on that decision. If being true to his own needs keeps them apart, then I will find a way to be okay with that. How will the show end? If you’ve ever watched or read an interview with Rebecca Bloom and Aline Brosh McKenna, then you know they’ve had the ending planned since they were first pitching the show to different networks, and, to our knowledge, they’ve never strayed from that original idea. However, I have no personal theories as to how this show will come to a close. Will Rebecca leave West Covina for good? Will she be single or in a relationship? What happens to not only Josh Chan, but everyone else we’ve come to know and love over the course of the show? Time will tell, but I have no doubt it will be a fantastic ending. 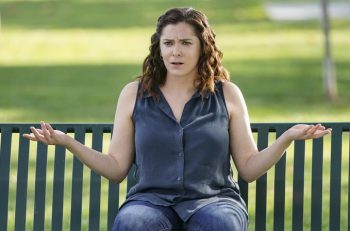 Crazy Ex-Girlfriend season 4 premieres October 12 at 9/8c on The CW.